It’s hot in the city. Europe’s record-breaking summer continued its reign as we wandered through the city of Graz in Austria. But it was no great surprise – Graz is known as Austria’s Mediterranean city. 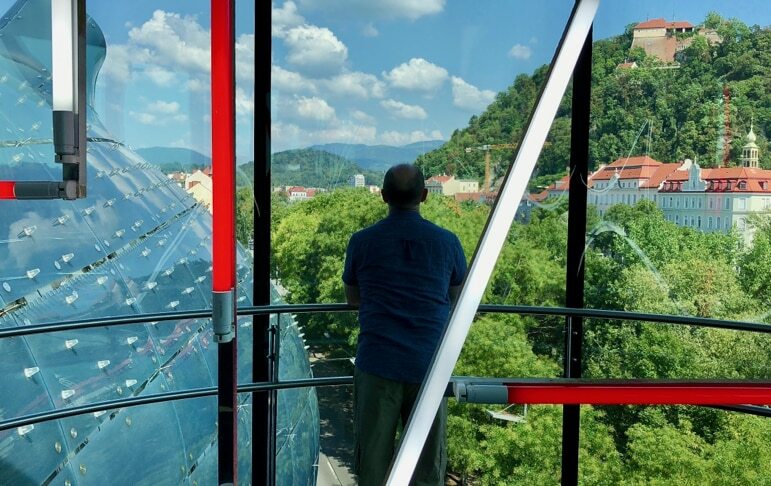 Ok, so it’s a good few hundred kilometres to the deep blue of the Med, but Graz lives up to its moniker with the laid-back lifestyle of the south, and of course, in late summer, plenty of golden sunshine. 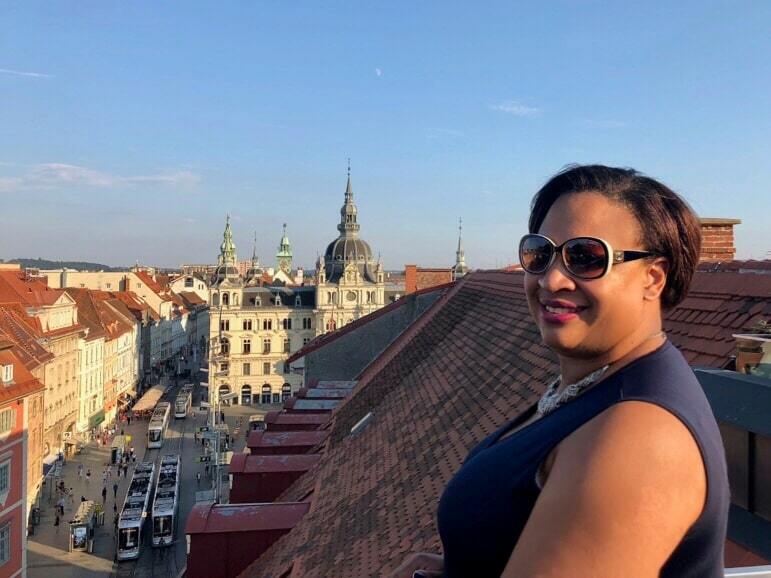 Making our way across the cobblestones of Graz’s winding old town, people poured into streets and squares outside bars and cafés to soak up the sun and the atmosphere. This relaxed nature was the first thing that stole my attention. 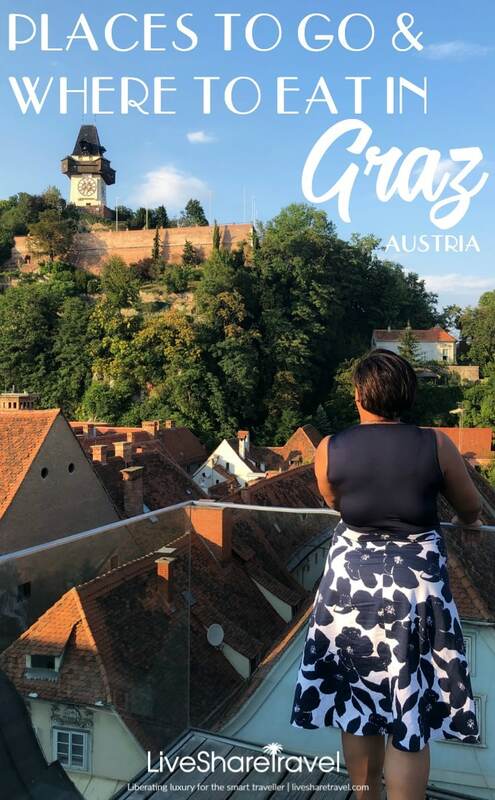 But the city of Graz is also a cultured one – its old town is a UNESCO World Heritage Site, it has boldly modern architecture and art, and as Austria’s Culinary Capital, it also has unfathomably good eateries and a standout annual food event, The Long Table. Austria’s second city, Graz isn’t a place of brashness and urban rush, but one that appeals to the senses in a different way. It’s a feelgood city, one of those with plenty to see and do, but part of its joy of it is in taking time out from all of the sightseeing to just enjoy your time there. It’s less of a sightseeing and more of a life living kind of a place. 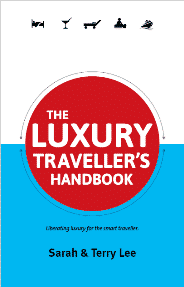 And in doing so, you truly can live like a local, because the people of Graz are all about living life to the full. Watch our video to get a feel for Graz. For those that like a checklist of places to visit on a city break, Graz, in the region of Styria, has plenty to see. We started this, our second visit (the first was for Graz’s Christmas market, so it had a very different feel) overlooking it from on high. At the heart of the city, we found ourselves at the end of a cavernous entrance. 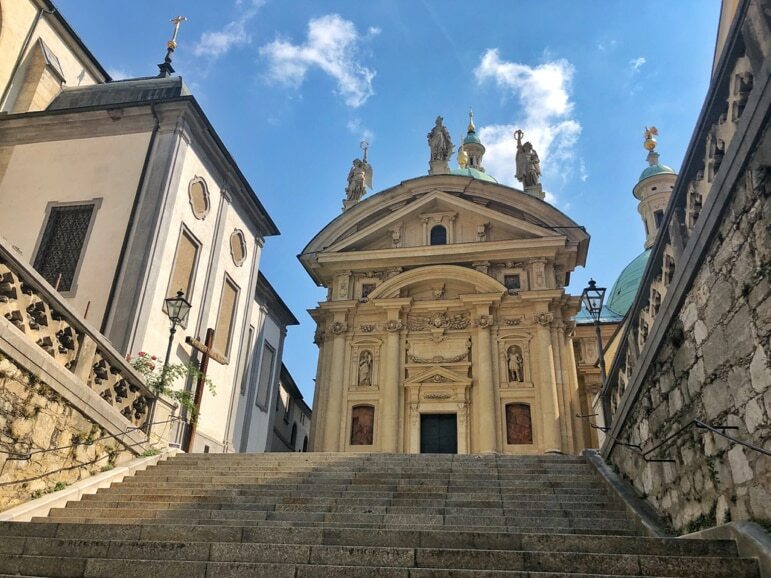 We felt the opening to the Schlossberg before we walked on in – the chill emitting from its centuries-old grey dolomite rock heart cut a cold path through the steamy city air. Walking into the cave was like entering an over chilled air-conditioned room. There is a network of tunnels down here, some of which lead across the city, and a small train proves an entertaining ride for families. But we were soon in a lift that would shoot us up to the top of the Schlossberg, sitting at 473m over the city. 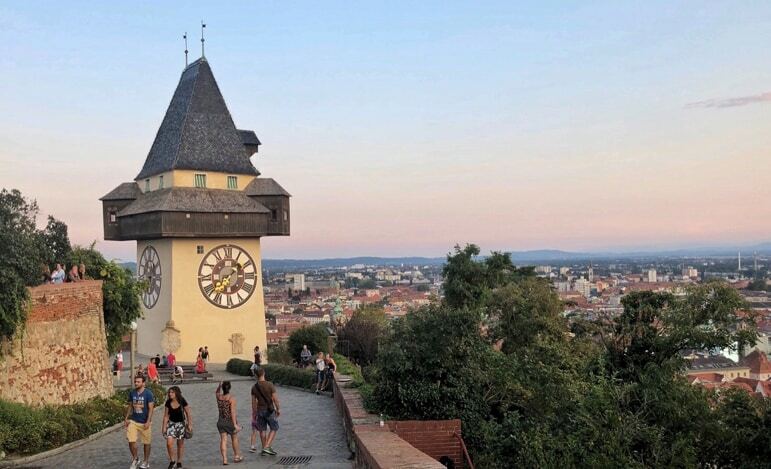 The lift brings you out to the 300-year-old clock tower, a major Graz attraction and symbol of the city. The clock tower and nearby 16th-century bell tower are all that remains of the buildings that made up a fortress on the hillside. But don’t fret that all that character has been lost, the area where the fortress once stood is now a park and offers great panoramic views of the city. Meanwhile, the clock tower with its unconventional way of showing the time (the shorter hand shows the minutes, while the long hand shows the hours) reveals just some of Graz’s quirky side. 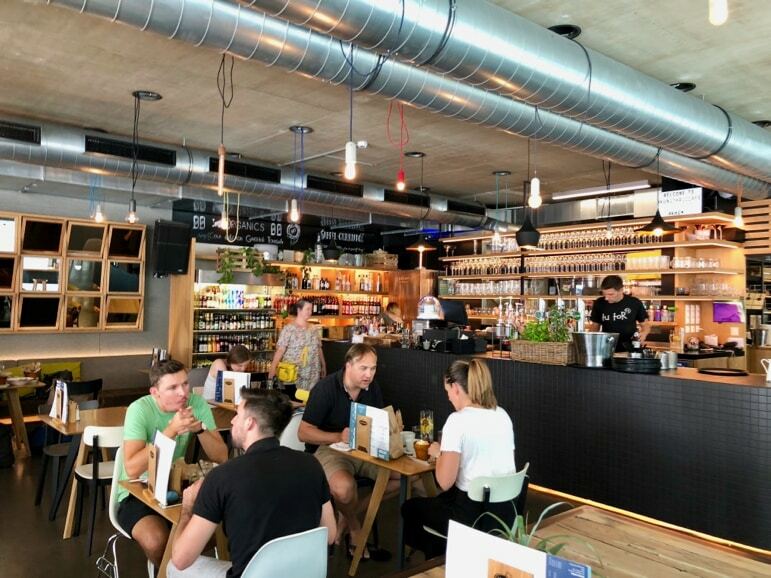 The Schlossberg is also home to one of Graz’s many great restaurants, Aiola Upstairs, but more on this in our restaurant recommendations below. There are two other ways up the Schlossberg – firstly there is a steep funicular to take the strain out of the trek, or you can walk approximately 250 steps with beautifully carved stone walls from the square below, but we preferred to take the lift up and walk down the stairs after the pink of the summer night sky faded to black. 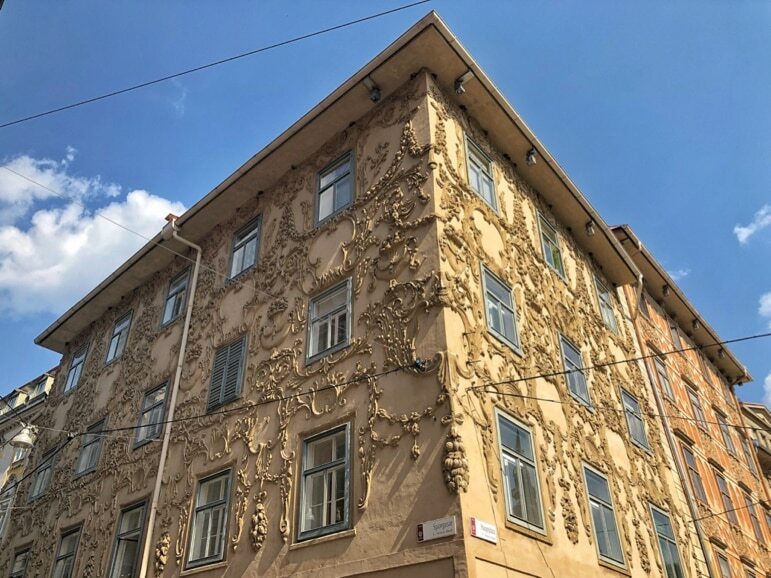 Every time we wandered through the streets from our hotel, at the heart of Graz’s old town, it felt as though we were walking fabled paths through history. While its architecture gave us plenty to stop and stare at – its Gothic, Renaissance and Baroque styles are a testament to its position at the crossroads of the Germanic region, the Balkans and the Mediterranean – that isn’t where its charm begins and ends. This UNESCO World Heritage Site has broad boulevards, squares, and medieval lanes and alleyways with cool boutiques that seduce you to explore them. 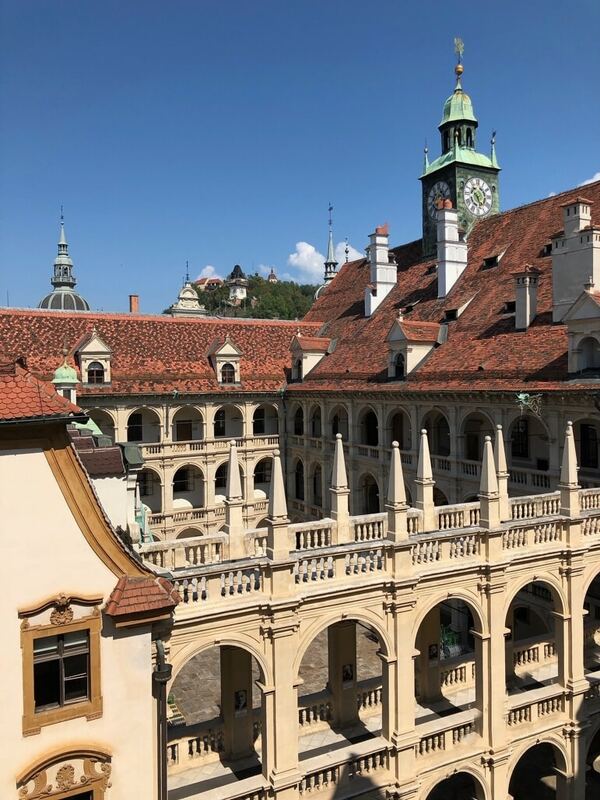 The main buildings to spot in Graz’s historic heart are the Landhaus and its courtyard surrounded by Italianate arcades, which dates back to 1557, the classically-styled city hall and the mausoleum of Emperor Ferdinand II. The mausoleum was one of the first buildings to grab our attention in the old town because it was not far from our hotel, on Burggasse. But also because this striking golden Baroque building seems to appear out of nowhere among the residences and businesses of the historic centre. It is right next to the city’s cathedral, the Katharinenkirche and has marble columns, paintings, and statues. 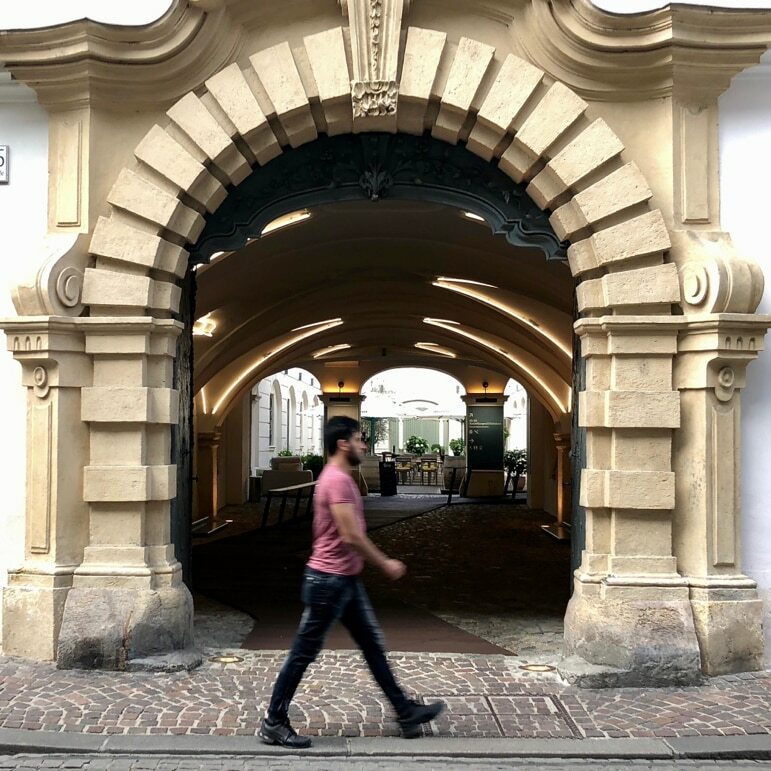 The first time I spotted the Landhaus, I was taken by its fairytale interior courtyard with three layers of arcades, but I only had the opportunity to view it from its square. This time we had the chance to go up its uneven staircases and wander those arcades during the Long Table Event, and it felt like we were tip-toeing through a Renaissance masterpiece. 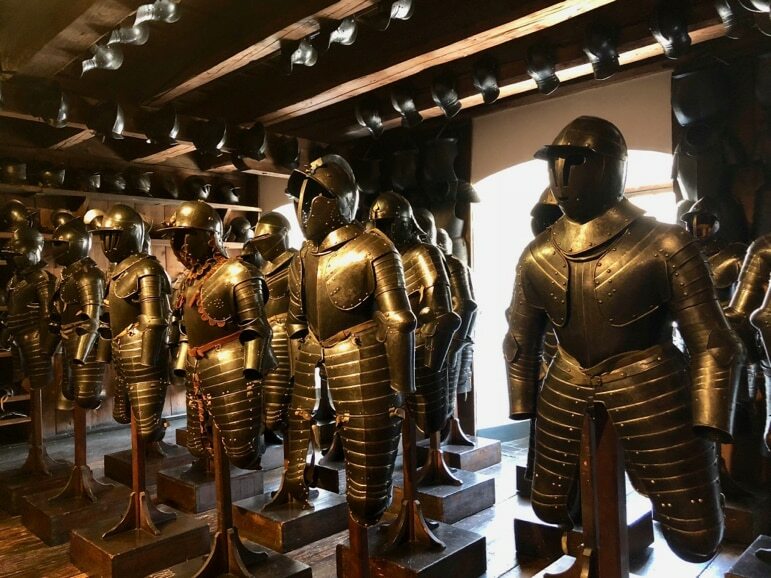 Graz has lots of museums and though we usually prefer to take in a city’s culture from its streets while learning from its people, we had a hot tip that the Styrian Armoury Museum at the Landeszeughaus was a must visit. Even as I write this it feels strange, as I’m really not someone that would ordinarily be interested in old armour and certainly not the history of warfare. But the armoury museum, which is hidden away behind the arcades of the Landhaus, is a surprising attraction. Here you’ll find more than 30,000 pieces – yes, really – breastplates, helmets, chainmail, full suits of armour, sabres, swords, flintlocks and pistols, even a couple of cannons. If in the past 300 or so years you could attack someone with it, or defend yourself with it you’ll find a piece here at the world’s biggest historical armoury. 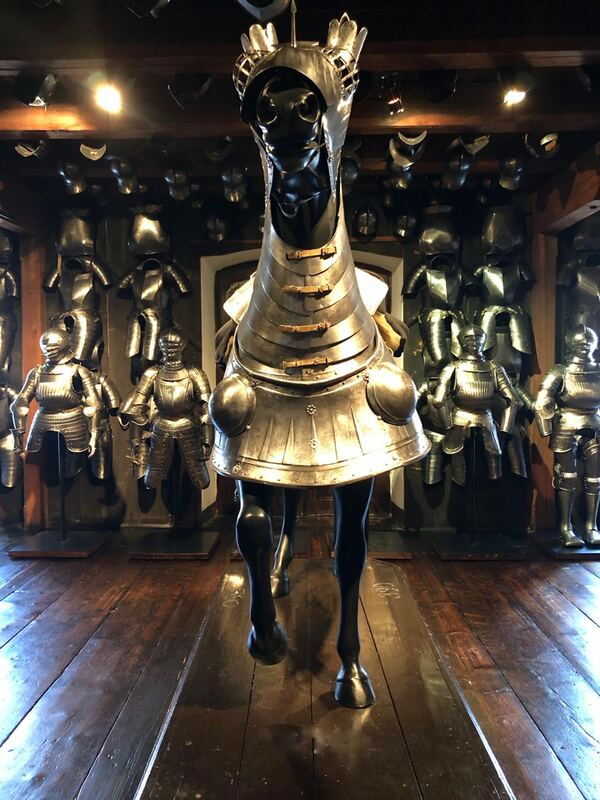 There is even a full set of horse armour there – something I’ve never seen before or even contemplated the existence of. The history of the building itself is fascinating as it isn’t a purpose-built museum, but it is housed in a building constructed in 1642 as an arsenal to allow the people of Graz to arm themselves in case of attack. You genuinely can’t miss Graz’s Kunsthaus or Museum of Modern Art. We spotted its blackened, amorphic form, from the Schlossberg on our first night in the city. The word GUILT lighting up along its side in big white pixels, or its BIX facade as it’s known. The next day we discovered that the world is part of artist Monica Bonvicini’s contribution to the Faith Love Hope show on display there at the time – just one of the countless international artists who have chosen to exhibit in the city. 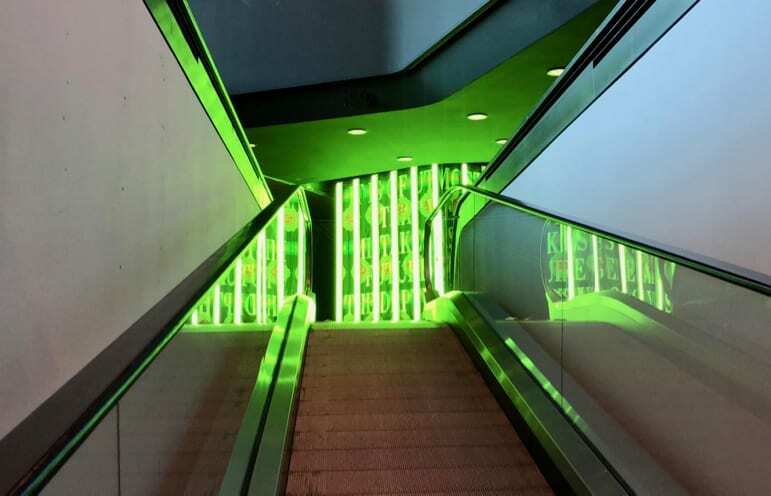 Inside the exhibition continued with other words grabbing my attention, and a green box lighting up the next level as we floated up on a travelator. The Kunsthaus has an edgy collection with pieces from the 1960s onwards that are compelling and even confronting in places. Naturally, when the Kunsthaus opened as part of Graz’s year as European Capital of Culture in 2003, this unusual piece of modern art itself had its detractors. The nickname the Friendly Alien stuck, and today most locals of this classical city seemed to have warmed to their 21st-century invader. 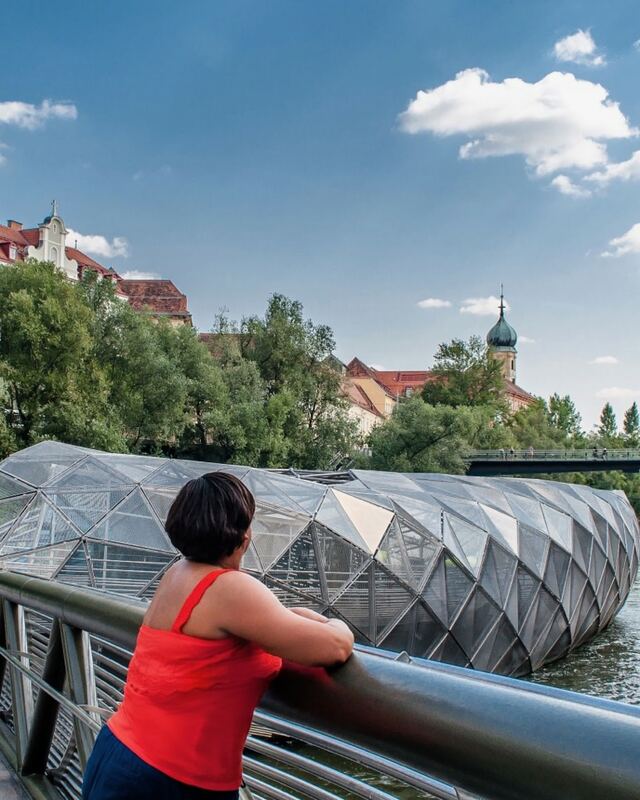 Another of Graz’s European City of Culture projects, and one that helped it secure its position as a UNESCO City of Design, is just a few hundred metres away on the River Mur. Is it a bridge? Is it an island? Is it art? You decide. 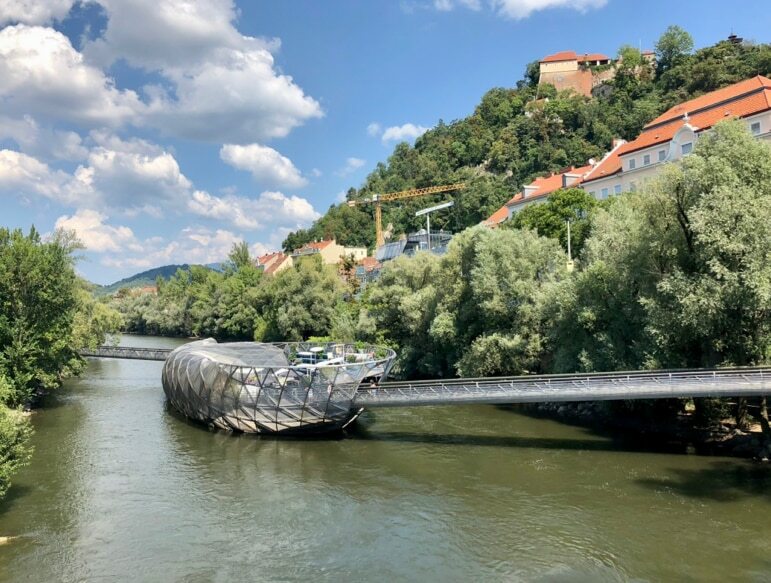 But the Murinsel, or Mur island, snakes across the river with a pedestrian bridge from both banks leading to a large glass and steel bowl shape that floats in the middle of the river. We couldn’t resist wandering over as the last time we were in Graz in winter it was closed. But this steamy summer’s day people found their deckchairs at its open-air café to soak up the sun by the water. It was a perfect place to enjoy the views over a coffee. Beneath the swirling bowl is a small amphitheatre, where if you’re lucky, you may even catch a performance. Also look out for the Murinsel at night as the island, created by American artist, Vito Acconci, glows with blue light. 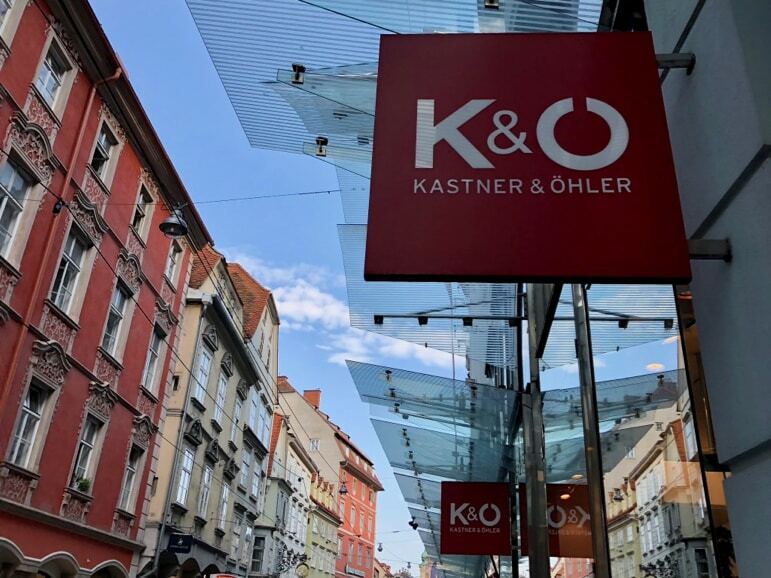 Shop till you drop if you will but Graz’s biggest department store has more in stock from its rooftop restaurant. It is one of Graz’s most Instagram-worthy spots. Kastner and Ölher has all manner of goodies inside from designer labels to delicious local food produce in its basement – vulcano ham chips (a delectable fine ham from pigs reared in Austria’s volcanic region about 50 kilometres from Graz), as well as the local dark green pumpkin seed oil, are the big tips here. But head up its escalators to the sixth floor to find its open-air restaurant and some of the best views in the city. 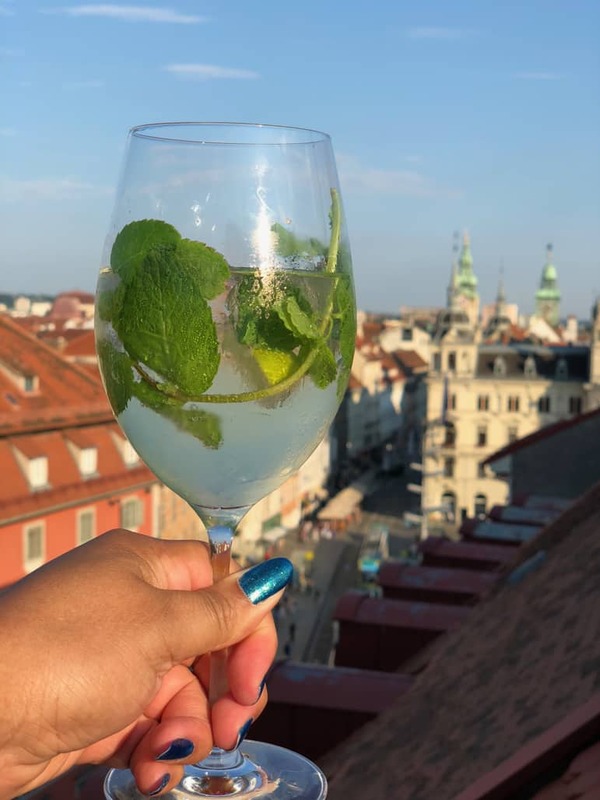 Over a Hugo – a refreshing mix of prosecco, elderflower juice and sparkling water, we took in the red-tiled roofs, that paved a path towards city hall. 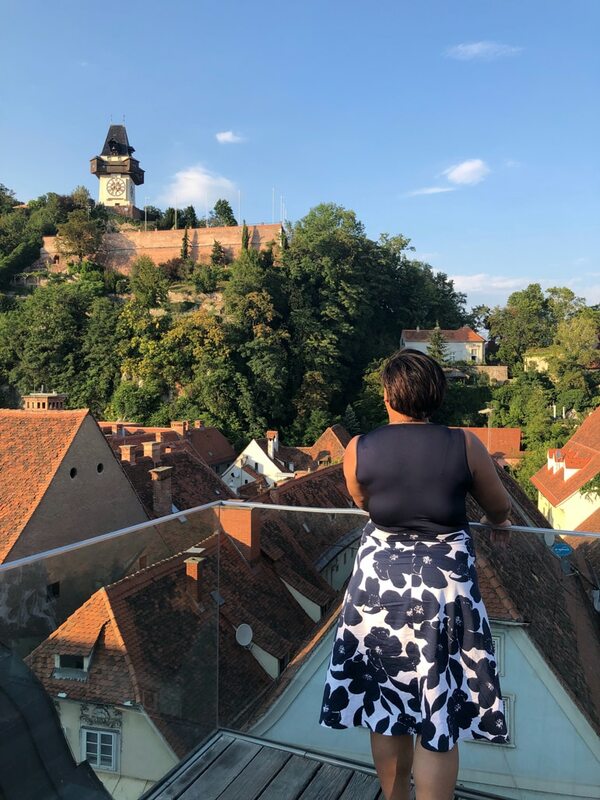 In the other direction, we were looked down on by the evocative clock tower and the green hillsides of the Schlossberg, as we savoured the moment, the atmosphere, and Graz’s sights bathed in sunshine. Head out of town to visit Graz’s other UNESCO World Heritage marvel – Schloss Eggenberg, a 17th-century palace with landscaped gardens and a lavish Baroque and Rococo home. Astrological symbolism is everywhere, with 365 windows, 52 doors and 31 rooms on each floor plus four corner towers. It also has 500 dramatic painted ceilings and 24 staterooms with original tapestries. Purchase a Universalmuseum Joanneum 24 or 48-hour ticket from €13, and you can visit not only the Armoury Museum, Kunsthaus and Schloss Eggenberg, but also the Graz Museum which charts the city’s history. Spiral out of control at the 500-year-old Doppelwendeltreppe, which has very unusual double spiral staircases. Sample biscuits at the antique Hofbäckerei Edegger-Tax bakery, in Hofgasse. Its the oldest functioning bakery in Graz, founded in 1569. Go to market – Graz loves its farm-fresh foods and there are a number of farmers’ markets across the city where we found some unusual but tasty offerings. The main one is Kaiser Josef Markt beneath the imposing Baroque opera house. 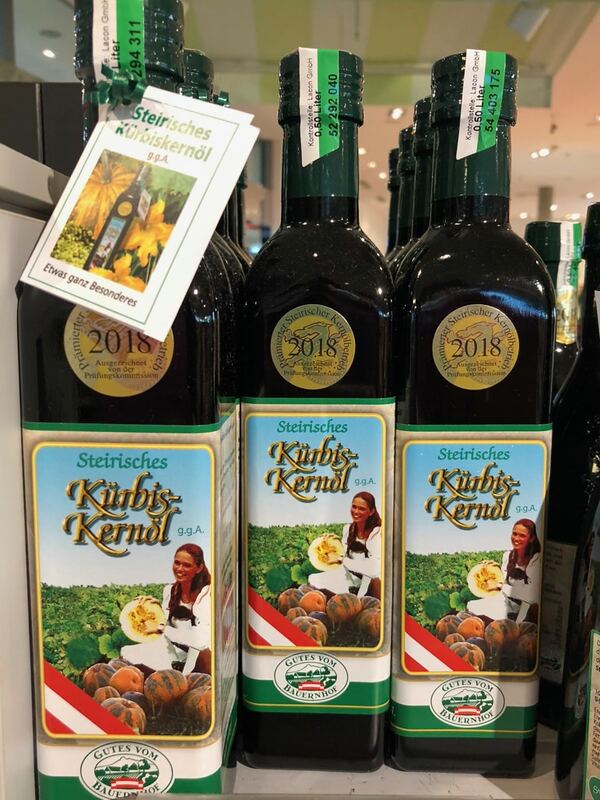 Here you’ll find meat, cheese, pumpkin seed oil and other things made from famed Styrian black pumpkins like pesto. 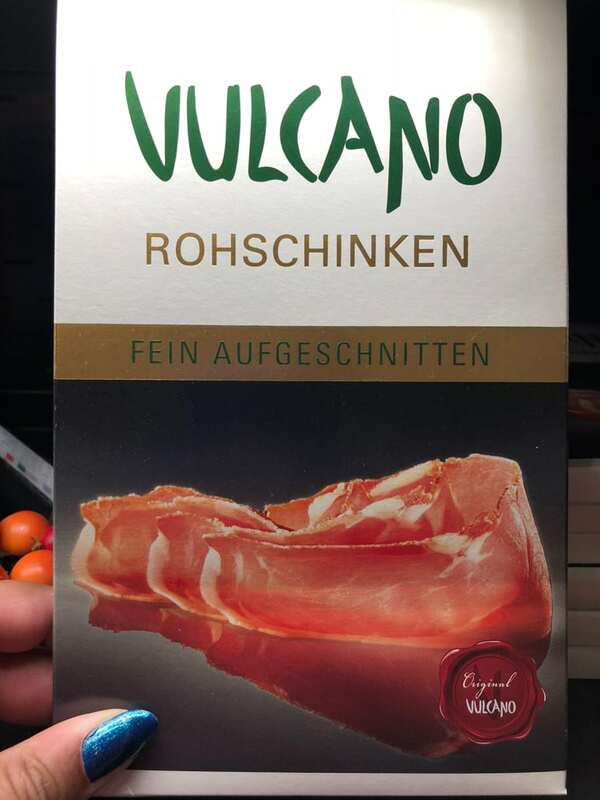 We bought that, plus mountain herb salt and an unusual vegetable – a lemon cucumber there. Another market to head to is in trendy Lendplatz where you can choose from a selection of products from over 800 farmers. Get to grips with Styrian cuisine at Kitchen 12, which runs fun cooking workshops, where you get to eat the delicious fruits of your labour. All that exploring will mean you have built up an appetite, and if you’re looking for good food, you’re in luck – Graz is not Austria’s Culinary Capital for nothing. It has a food scene every nonna, or I guess as we’re in Austria that should be oma, would be impressed by (want to be able to cook some local dishes? Check the link for traditional recipes Germanic grandmas would make). Head here for a laid back bite and you won’t be disappointed. With an industrial feel and many communal tables you can choose from a good value breakfast and a great selection of lunches where much of the produce comes from local farms. You could even pop in for cocktails and dinner later. 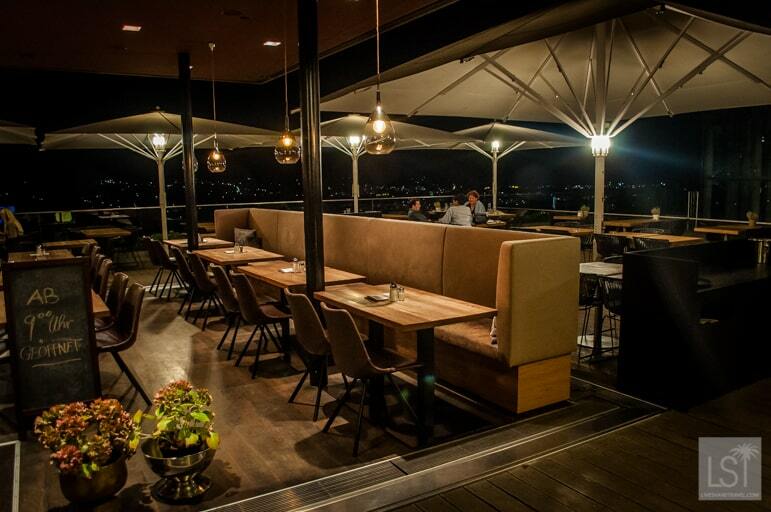 Food comes with killer views of the city at Aiola Upstairs, serving a modern Styrian menu. Even the bread before the meal was a treat with delicately flavoured basil oil to dip it into. 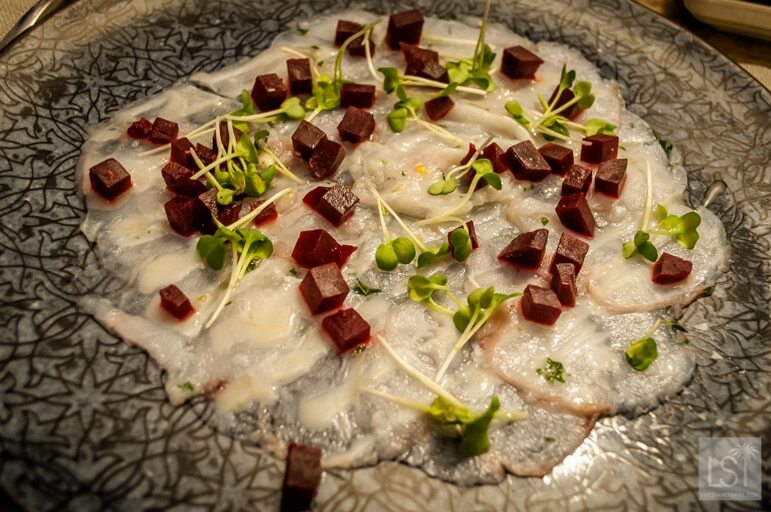 I really enjoyed my carpaccio of monkfish with beetroot, daikon cress and lime starter and crown of duroc pork with a potato beer andjalapeño gratin, and spinach – the meat was tender and the whole dish very well cooked. Terry meanwhile had juicy prawns with his risotto with sherry. Food and service are first class at this fabulous restaurant just off the Hauptplatz. It is also a very historic restaurant which has served all manner of princes and noblemen for over 400 years. 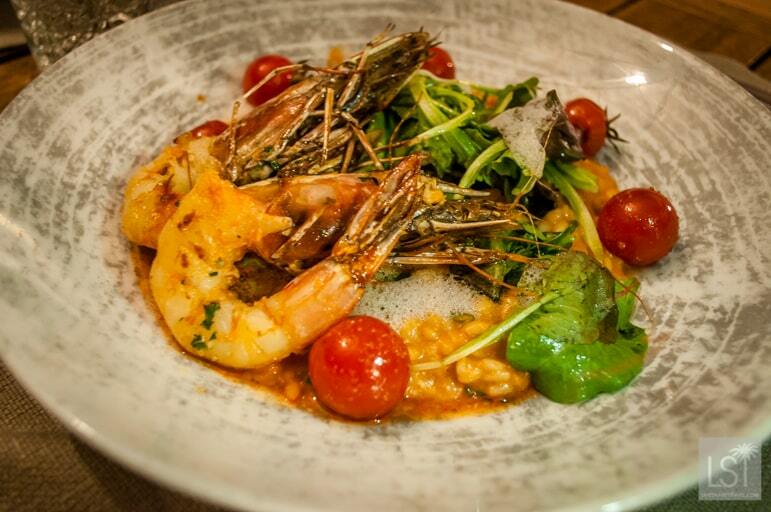 It is an elegant setting serving a contemporary take on Styrian food. 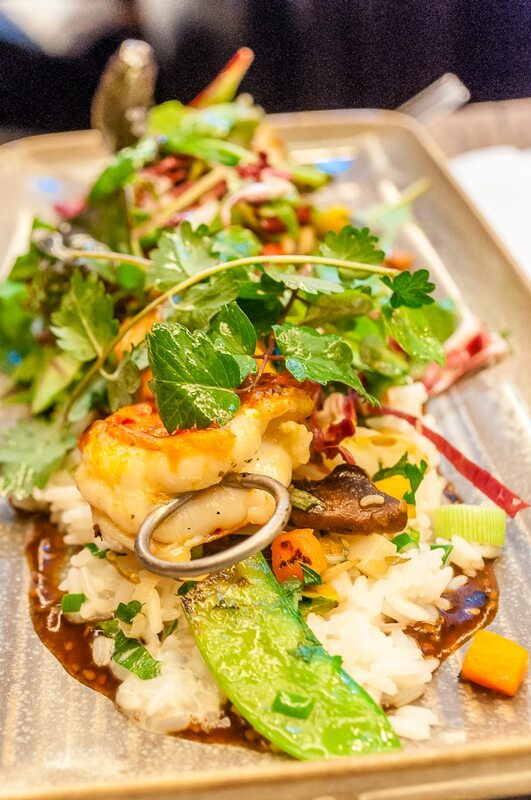 In winter, we enjoyed dishes like grilled skewer of white catfish and prawn on Asian vegetables and coconut and young leek rice, and crispy duck haunch with apple red cabbage, with caramelised chestnut and pretzel slice. In the summer the menu changes to reflect the season and you can enjoy a rather magical evening as its tables spill into the Landhaus’ courtyard where you eat beneath the arcades. Stainzerbauer restaurant serves up choice products from Styria in a seasonal selection of dishes, such as salmon trout with beetroot risotto. Housed in a very old building, it has wonderful character and a fabulous take on local specialities. The wine selection here is also very good. At 500 years old, Restaurant Krebsenkeller is the oldest restaurant in Graz and has vaulted ceilings inside and a lovely courtyard outside to enjoy during the warm weather. Food is Styrian walking a line between traditional and modern dishes. Restaurant Carl by Philipp Haiges for an upmarket traditionally Styrian meal in rather plush surroundings. 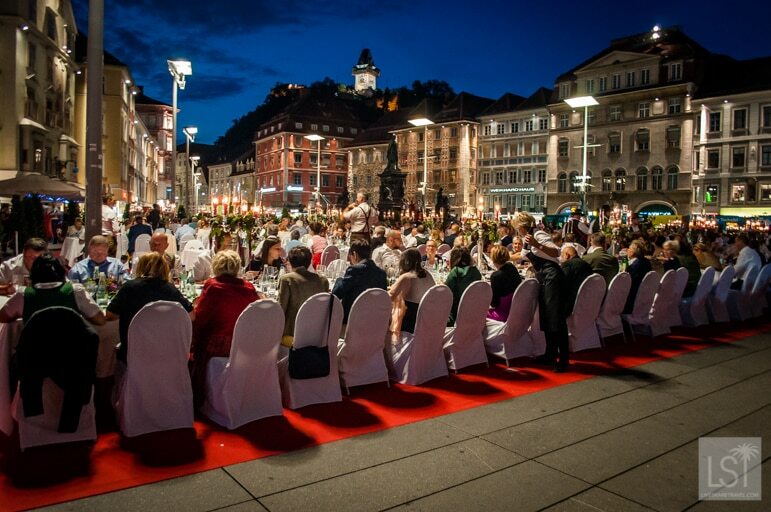 If food is your passion and you have the opportunity to attend the annual Long Table event in Graz then do! 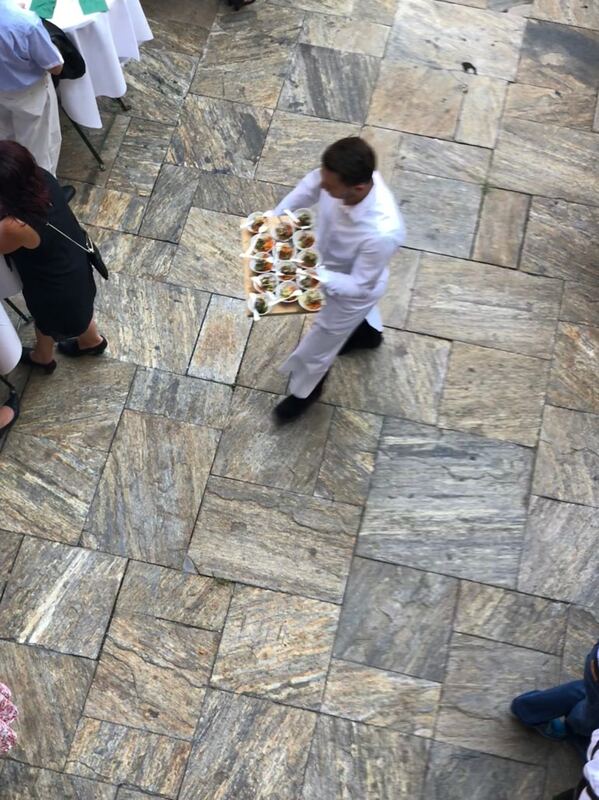 It sees 750 people served a gourmet meal cooked by more than 30 of the city’s best chefs. Diners are seated at what is now a number of long tables in Hauptplatz before the City Hall and with impressive views of the Schlossberg. With food for the event coming from no more than 35 kilometres away and a focus on Styrian cuisine, you are assured of the most local food experience. 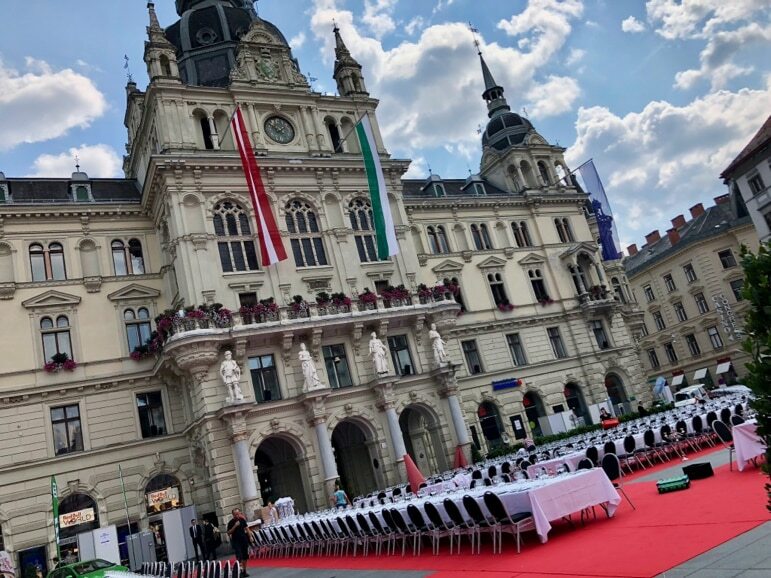 It’s a full evening event starting with drinks and canapés beneath the arcades of the Landhaus first, and featuring local bands and singing later into the night. Tickets to this popular event go on sale on the morning of November 15 – but hurry, they usually sell out in just 20 minutes. Here’s a map of all the places we’ve listed here in this Graz travel guide. The five-star Schlossberg Hotel has very friendly and helpful staff, nice artwork throughout, lovely rooms, a spa, an abundant choice of foods for breakfast and the bar was open 24 hours a day. The four-star Hotel zum Dom is in the heart of the old town, so perfectly located, with comfortable rooms and an airy restaurant for breakfast, lunch and dinner. There are currently no direct flights from London to Graz, however, it’s possible to fly indirect with KLM, Swiss, Austrian Airlines, germanwings, British Airways, Air Berlin, Flybe, Aer Lingus and InterSky. There are buses from the airport into the city centre, one-way tickets cost €2, or there are plenty of taxis available for what is a short (approximately 20 minutes) and inexpensive journey. The train service in Austria is very good, so you could also contemplate flying into Vienna, to which there is a plentiful supply of flight connections, and taking the train from there. The train journey takes three hours from Vienna airport.